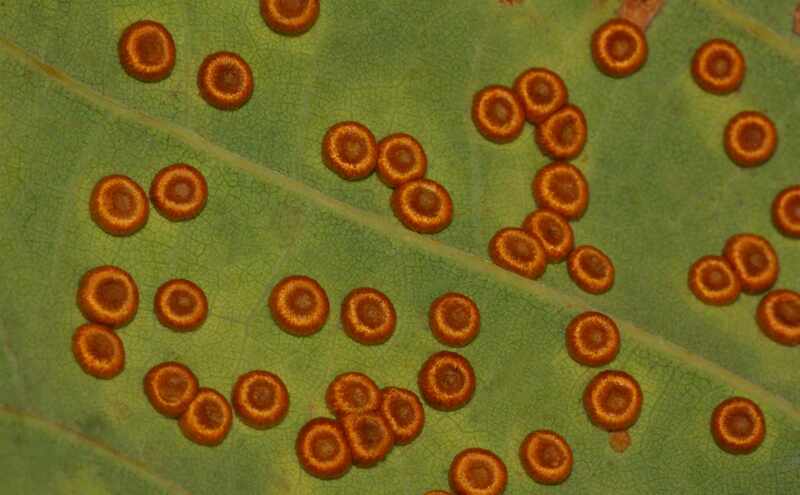 DESCRIPTION: Up to 3mm across these silky concave galls are tawny-gold brown in colour and are usually massed in fairly large numbers on the underside of the hosts leaves. The galls hold the agamic generation (specimens that occur without male/female reproduction). Each gall holds one larva and is best seen from late July up to early November with adults emerging from fallen galls the following late winter. DISTRIBUTION: Frequent throughout Britain, most common in the south. HABITAT: Found on the leaves of various Oak species.